"Raises important, powerful issues, and holds them up to scrutiny." Beirut, 1985: Father Sean Pearson is abducted by Hezbollah. Seventeen years later, he is captured by US Special forces in Afghanistan as he plays soccer with members of the Taliban. What happened in those 17 years is a question Marsh, a career intelligence officer, is determined to answer. Is the Priests reticence to answer questions a result of his captivity, or does it hide a more sinister agenda? Marsh does his job with the ferocity of a zealot, aided by John Cervantes, a man aware at all times of the impact of this case on his career. As the evidence against the Priest mounts, he returns to America, where demonstrations for and against him take place. Diplomats wrangle, doctors diagnose and the radio host prognosticates as the Priest sits seemingly unaffected by it all. Can sympathy for his plight prevail or will his attachment to his captors prove his undoing? A new production of The Cleric recently closed in New York. It was a joint production of Mind the Gap Theatre and Hand-Rubbed Productions, directed by Paula D'Alessandris and featuring Richard Lester as Father Sean Pearson. More information on this and other productions can be found on the production history page. 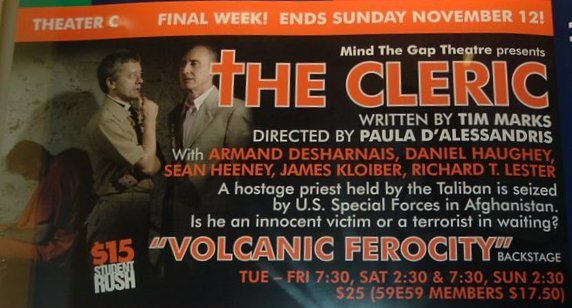 I'm grateful to Mind the Gap Theatre for bringing [The Cleric] to the NYC stage... The Cleric raises important, powerful issues, and holds them up to scrutiny in a more human and accessible way than the 6 o'clock news or a docudrama drawn from it ever can... it's compelling theatre, and certainly helps focus us on subjects that we might be too willing to shut out of our daily consciousnesses. A thought-provoking, often ambiguous play... The Cleric raises questions about politics, morality, and whether humanity can persevere in the face of brutality and war. Particularly clever in Marks' writing is the acid tongue that Father Sean uses as a defense mechanism... [Father Sean], as well as Father Neil... are excellent studies in ambiguity. Longer quotes from reviews of The Cleric, as well as reviews of other productions, are available on the reviews page. Act I, Scenes 1-3: In which Father Sean Pearson meets his latest captors: the American government. 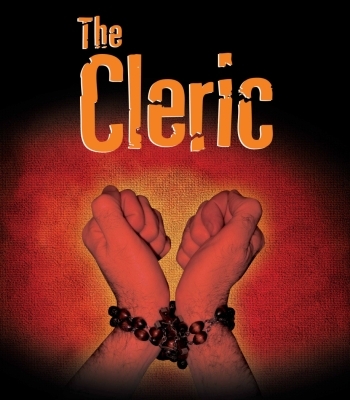 The Cleric and all excerpts from it are © 2002 Tim Marks. Excerpts may contain strong language or violence.